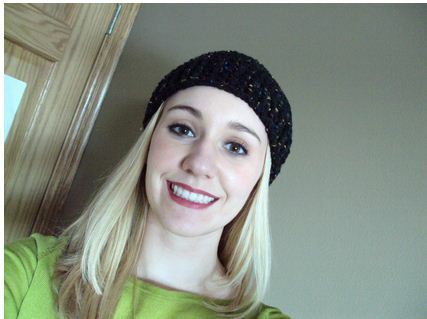 That is so cool…looks great on the hat…thanks for sharing. Thanks! Leave a picture when you make your own! Love this pattern, but am I missing something? The opening in the mouth area for the mustache? I am part way through the pattern now. Thanks so much! Hi Sherri, You make the mouth opening/ mustache part in Row 9 when you work 9 foundation chain stitches (or regular chain stitches if the fch is too difficult). You skip 9 stitches from the previous round which will give you a nice opening, then work 11 stitches on the other end. This should give you a nice wide space for your mouth. Let me know if that makes sense! I love this pattern, thank you so much. My son has wanted one of these since I showed him a picture six months ago, I just haven’t taken the time to try to make a pattern for myself. One suggestion though. I would simply stitch a button on the inside of the hat on each side where the beard should connect. That way the beard would be removable. Just a suggestion, hope you continue to share, I love it! The button to attach the beard would be a great idea, Carrie – Thanks for the suggestion! That would be great Carrie! Velcro might be good too. I plan on learning to crochet just so I can make this. But I’d like to make a long one that can tuck into my shirt & keep my neck warm. Luckily for me my mom is quite a crochet fiend. I’ll post a pic of the final product. EEEEP. So excited. Sounds like a great idea! I’d love to see the finished project… Have fun! I have made a different style of these…they are so cute! I love them on little kids especially! Wondering if anyone knows dimensions for a 12 month old beard? I am making one as a surprise gift and haven’t made it this small yet. Thanks! Love this!!! So easy too!!! Thank you for sharing this pattern. My husband has been begging for one of these! A friend of mine just posted a picture on our hockey forum — I’m going to make a bunch of these in our team’s colors for next year’s Stanley Cup playoffs! Might also make one in orange with a black beard for San Francisco Giants games, especially if Brian “The Beard” Wilson comes back from injury! Such a good idea to make beards for your hockey team – I’m sure they’d love it! 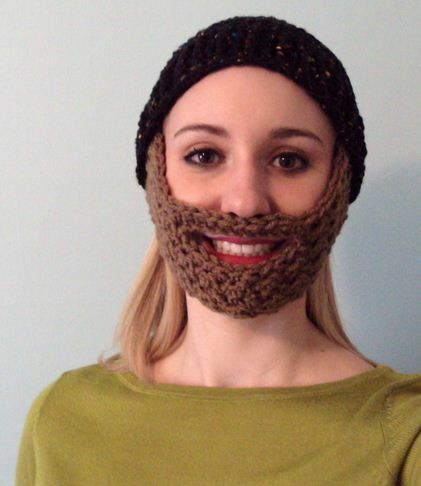 If you can’t grow a playoff beard, you might as well crochet one. I’d love to see pics if you make them! Just wanted to send you this, in case anyone had problems with the fsc. This is a very in-depth photo tutorial from futuregirl craft blog, and I found it to be a breeze to follow. I have the same question as Rae.I have chained one for row 1 but doing the *dc, sc* 15 times after that only brings me to 30 stitches in the row. Hi Rarity, I think the combo of the fch 30 and the chain 1 of Row 1 will bring you final stitch count to 31 for Row 1. You’re working 30 actual stitches, but if you count the first “ch 1” in Row 1 as a sc, you’ll actually end up with 31 stitches. Does that make sense? I was really hoping to have one of these made for my daugter who will be a year old soon. it is going to be part of her halloween costume which we would like to keep a suprise. is there any way you could send me the pattern for a 1 year old? i would greatly appreciate it. thanks. Is there a pattern for kids for this? something for about a 4 year old.. Thanks.. Still do not understand row 9?? Trying to make mouth opening. Did it three times but still connecting it closed. Suggestions? what is fch? i know dc is double crochet and sc is single crochet but i never heard of an fch….is that like just a regular beginning chain or is it something new and special? Just made my husband a Hagrid (Harry Potter) beard for Halloween. Took about an hour. Thank you so much!!! Thank you so much for this! My cousin just started chemo and he’s been bemoaning the loss of his beard. Hi Raina – Since I’ve gotten a lot of questions about how to make a FCH, I went ahead and made a demonstration video showing how to make the stitch. The video is here: http://www.youtube.com/watch?v=SPswCxaXRso Hope that help! And Rebecca – Thank you for sharing! What a great idea and use for the hat. 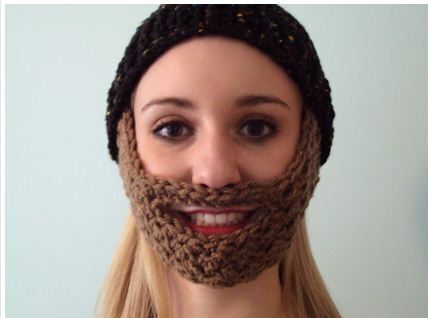 I’m sure bearded crochet hats would be the perfect thing to donate to hospitals and cancer centers. I’m glad you’re finding the pattern useful. I see several people have asked about a pattern for a child’s size. Am I missing the replies? Or is there no pattern? Thank you for posting that video. I have started the beard but I’m kind of scared it won’t be big enough for the guy I’m making it for he’s kind of a giant and I don’t know what to do about it any suggestions? Since there have been a lot of requests, I’ve written out a pattern for a children’s beard. Since each child’s face will be different, be sure to test the beard as you make it to ensure it’s the right side. Grab those hooks and make your little man some facial hair! I tried to make a beard but have no idea how I did it(pattern wise). But when I did it, I hade chain loops to hook them on my ears. This was an easy pattern to follow, thank you so much!!! I was wondering how you connect the beard to the hat and if there was a video out there to demonstrate this. I have tried several times and each time it looks worse than before. If you can help me I appreciate it. I have just started crocheting a few weeks ago and I have made several of the beards using your pattern. It is very well explained and super easy thank you so much. Now I am gonna try santa hats with beards! Glad you found it useful, Bren! I’m sure the Santa hats will look great. Can this be sold as a finished product if credit is given to you for the pattern? Love, love it! Making my first attempt tomorrow for my 4 yr old n hubby! Thanks! Absolutely, Jessica! You may sell any finished products you make from my patterns, as long as you reference where the instructions are from. You do all the work, I just provide the inspiration! Thanks for checking… good luck! 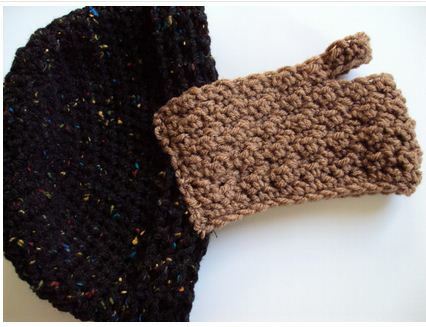 Do you use the same size hook for a child size as what you used for the adult pattern? Thank you so much for this jewel of a pattern. Everyone, male and female young and old will eventually have a beard hat. It is surprisingly warm with beard on and so easy to Change into a regular hat. Congrats!!! I made 6 beard hats for my nephews and my daughter for Christmas. We had the most hilarious time. My 25 year old nephew said it was the ‘best present ever’. Thanks so much! So first of all I loveeeee this, I followed the first pattern at the top for my 5 year old and it kinda fits perfectly. is it supposed to fit snug? I am making one for my cousin, he lives out of state and I am going strictly on measurements, didnt know maybe if I messed something up. My 5 year old son is a teeny little guy and I just didnt know if it was an error on my end. Thank you so much for this pattern, I searched and searched for the perfect one, and yours was the one that finally worked. I obviously am not reading this pattern right lol When i do the foundation chain i keep making a circle. I don’t get what you mean by “For remaining fch stitchs, insert hook under the strand to the left” I keep doing the same thing but it makes a circle! Is that what I’m suppose to be making?? Ahh never mind i just saw your comment up there with your video! Oh and I love your hair brown instead of blonde!